We Build BUZZ using social media! There are many ways to drive more leads to your site and bag more conversions, and one that’s especially hot at the minute is Instagram stories. In a nutshell, Instagram stories let users post pics and videos to their profile — but there’s a catch. After 24 hours, they vanish forever. It’s a lot like Snapchat, where content disappears in a similar fashion. Instagram stories have proven to be really popular, with CNN claiming they’re twice as popular as Snapchat. People find them insanely fun, over 50% of businesses on Instagram are already using them, but how can your brand use them for lead gen and conversions? Let’s find out. It’s worth pointing out that Instagram is growing at a crazy rate. Back in 2012, Instagram had 50,000,000 users but wasn’t making much cash. Facebook decided to buy it and, over the course of a few years, its user-base has grown to over 1 million. The rise has been meteoric, and it’s showing no signs of slowing down. The app bagged 400 million users by 2015, 600 million users by the end of 2016, and 1 billion users by 2018. People just keep on signing up, which is excellent news for businesses just like yours who need a large audience. Not just that, but Instagram stories have proven to be such a massive hit that you need to grab yourself a piece of the pie. Instagram themselves claim that 200 million people post new Stories each day. Snapchat isn’t very good for marketing. Most of its users are young people, and all you can do is add filters to your pic’s and videos. Instagram stories, on the other hand, allow you to be a bit more creative. With these, you can add stickers and text, and you can even draw on your photos. It’s also possible to add an outbound link to your post, too. 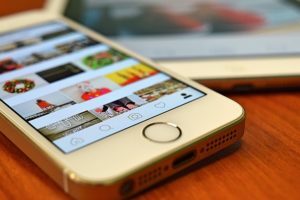 An outbound link is key because you can connect your Instagram story to your website, therefore improving leads and conversions. If a visitor likes your story and sees the link, there’s a very good chance they’ll click on it. There is one snag: Before you can add a link, you need to have at least 10,000 followers. Instagram stories have a low exit rate. According to research, the average exit rate is just 5%, and it’s possible that you can get yours even lower than that. This is perfect because, of course, if you want to convert a prospect into a lead, you really don’t want them bailing out of something too soon. However, to make sure they don’t exit before converting, you need to add a strong CTA. Instagram stories come with its own default “Swipe up” CTA, but it isn’t very compelling. What we suggest you do is add an on-screen message that’s a bit more urgent. Add it in bold text and stick it in the middle of your page before the Swipe up CTA arrives. Influencer marketing matters more than ever on Instagram. If you can find someone in your niche who has more than 100,000 followers, get in touch with them. Engage them, be personable and make friends with them. Then, politely ask if they’ll feature you in one of their stories. This gives you direct access to their followers. Instagram stories — as popular as they are — actually have a low view rate. If you can buddy up with an influencer who has 100,000 followers, a 5% view rate is already awesome. Ask them to feature you and your product, and make sure the story includes a compelling CTA and a link to your site. The problem you might be dwelling on right now is the need to have 10,000 followers before you can add links to your stories. 10,000 followers sound like a lot — and it is. Before you reach that magic number, you could instead tag yourself in your story. All you need to do is click the “A” when posting a story (it’s at the top) and then add your username, which will display as a clickable link. Then, whenever someone is watching your story, they have a chance to click the link and check your profile out more closely. Make sure your profile is good and ready, and include a link and a CTA to your website in your bio. Instagram stories highlights is a feature that’s been around since 2017, and it lets users put together a permanent collection of stories on their profile. Before this feature existed, it was a lot harder for someone to track down your stories. Now, you can bring your best ones together for everyone to see really easily. They’ll be sandwiched between your bio and your Instagram feed. Each time someone taps on one of the stories, it will start playing. This feature lets you highlight promotions, new products, new blog posts, and so on. And, of course, you can add CTAs to each post and send more people to your website. Lastly, you might find that your organic reach is a bit underwhelming. In which case, you might decide that paying for ads is the next best thing to do. Instagram ads have been around for a year now. They drive traffic and conversions — the two things you want more of. Each time someone taps your ad, Instagram takes them to your site. Sound good? Instagram is at the top of its game right now and you don’t want to miss out. Focus on good content to grow your followers to 10,000, and then roll out the links, the CTAs, and the ads. And good luck!